Late last night, despite a smug-making dinner of steamed kale and broccoli, chocolate cravings hit hard. Of course, the cupboard was bare of treats except the packet of TimTams being saved for soul-resuscitation on a really dark day. There were, however, some chocolate chips I’d hidden from myself in the freezer, and after some idle drooling over Pinterest I figured there was nothing to lose by attempting this chocolate pudding. Have you made pudding lately? It’s crazy dessert alchemy. You start with simple cupboard staples, stir over heat for a while. Nothing seems to be happening and you start to think you’ve been duped… and then in a flash it thickens and comes together and you’re left trying not to eat the entire bowl of hot pudding before it has a chance to chill. 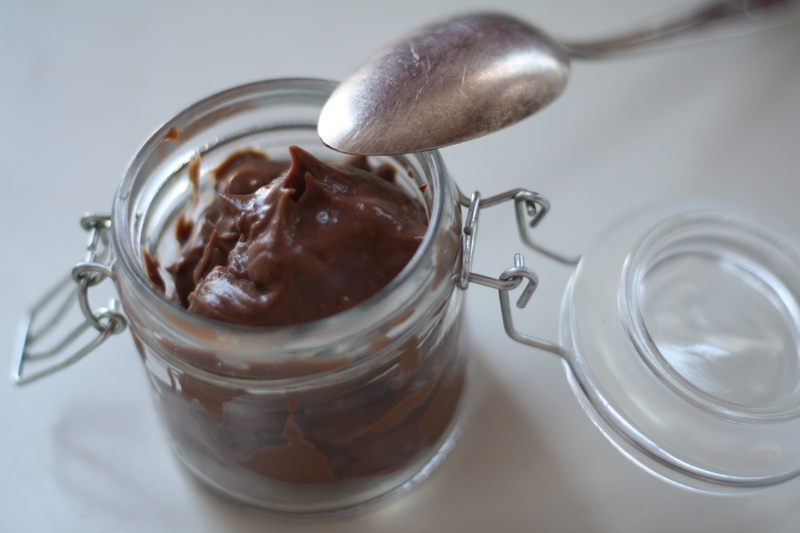 So here’s an easy chocolate pudding, from Smitten Kitchen via Wednesday Chef via John Scharffenberger. No eggs, no cream, no drama – yet still rich, smooth and comforting. I’ve reduced the quantities to a respectable amount for 2-3 chocolate-cravers – for a dinner party of 4-6 I’d use the original quantity (double this) and chill in cute glasses or jars. Mix cornflour, sugar and salt in the top of a double boiler (set a glass or metal bowl over a saucepan of simmering water) and whisk in the milk gradually. Stir occasionally for 15-20 minutes until the mixture thickens enough to coat the back of a spoon. Add chocolate and stir for another 3-4 minutes until the chocolate is incorporated, the mixture is smooth and thickened to a pudding consistency. If you find that your mixture doesn’t thicken in that time, you can dump it straight into the saucepan (tip out the water first!) over a low heat. With direct heat you should find it will thicken up in about 30 seconds so have that whisk ready to work out any lumps! If you’re a perfectionist you can strain the pudding through a sieve to remove lumps… otherwise pour the pudding into your serving dish (or individual dishes) to chill for at least 30 minutes. To avoid pudding skin, cover the pudding with plastic wrap pressed onto the pudding’s surface as it chills. My newfound pudding crush started with this Kick-Butterscotch pudding from Food52, which I made and devoured before thinking to photograph it! Cornstarch and milk form the base again, but butter, sea salt and dark brown sugar bring a delicious butterscotch flavour. Add cream for richness and a dash of whiskey at the end for a grown-up twist. Again, the challenge is not eating it all immediately. Melt 2 tablespoons of the butter over medium heat in a heavy bottomed pan. Stir in sugar and salt to the melted butter, whisk in the cream and reduce heat to low. In a small bowl place the cornflour, then whisk in the milk until the cornflour is dissolved and the mixture is smooth. Stir this into the saucepan and increase heat to medium. Keep stirring for a few minutes, until the mixture thickens so much you can easily see the trail of your spoon. Don’t stop stirring! Remove from heat and stir in the last spoonful of butter, the vanilla, and the whiskey if you’re using that. Strain out lumps if that’s your thing, set to chill in serving dish(es) and cover with plastic wrap to avoid skin.